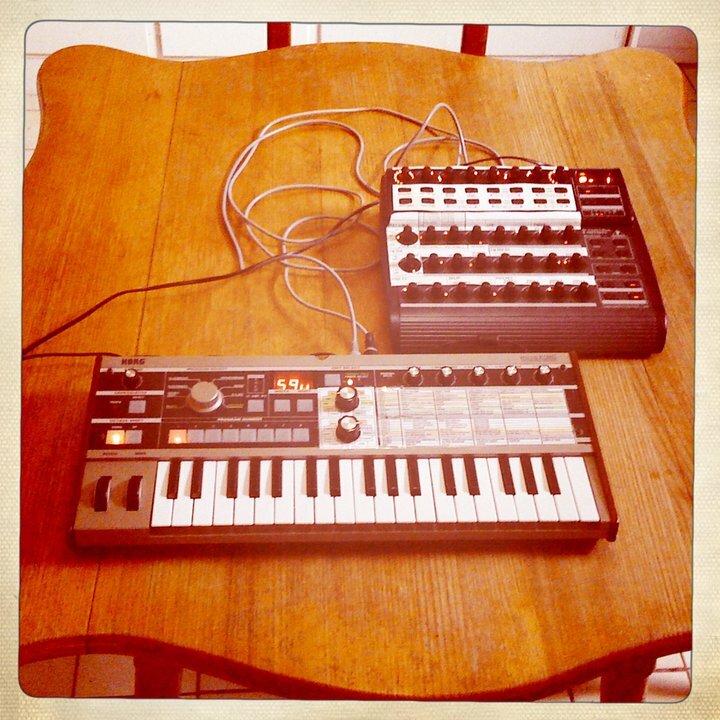 I've got a MicroKorg, and I've set up a BCR2000 to tweak more of the parameters at once! Read on to see how to do it! 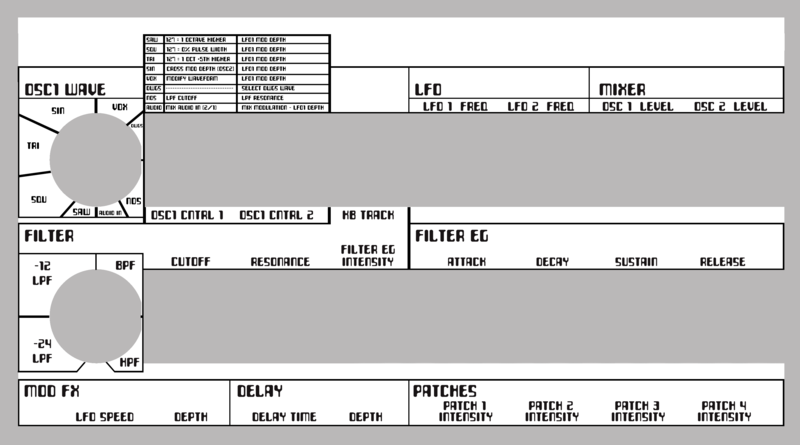 I found the Edit Matrix on the MicroKorg a bit hard to follow visually, so I made a custom overlay for the face of it to make things easier (see MicroKorg Customface). But I thought I'd take it a step further! I wanted to be able to tweak more parameters at once, so I could adjust more parameters immediately and simultaneously (like on a fully featured synthesizer interface). So I decided to buy a Behringer BCR2000, and see if I could map all the knobs and buttons to various parameters on the MicroKorg. It turns out that you can! And it does a pretty good job of it! I've made a document that outlines how to make the settings step by step. I've also made two overlay images that can be printed out (at 100% size, on landscape A4 paper) that you can blu-tack to the top and bottom of your BCR2000, so you can easily see what each control does! You'll need to follow the document to program the settings into your BCR2000. It basically uses MIDI CC (Control Change) values to speak to the MicroKorg. You don't really need to do anything to the MicroKorg - it will automatically communicate back to the BCR2000 when you tweak knobs on the MicroKorg interface. You simply follow the instructions in the document, and save it as a Preset on the BCR2000, and you're done! That'll be saved on there permanently, and it's ready to go as soon as you turn them on and plug them together. You just need a BCR2000, a MicroKorg and two MIDI cables. UPDATE: If you don't want to program it in manually, you can download BCRFEdit, a user made application for importing, exporting, creating and editing your own presets for the BCR2000 (it seems much better than the application provided by Behringer), and you can use this to transfer my preset straight to your BCR2000 without having to manually make all the settings yourself. You can download the SysEx file for my Preset here. Enjoy! Just be careful not to overwrite or lose any of your own presets when using BCFREdit. I'd LOVE it if anyone could help me with the final piece to the puzzle! My only remaining question is, how do I get the MicroKorg to send all the values over to the BCR2000, each time you switch to a new "instrument" on the MicroKorg? Everything else works 100%. I believe you are meant to be able to make the BCR2000 send a Data Dump Request to the MicroKorg, thus receiving all the new values, so the BCR2000 is lit up to reflect the values on the MicroKorg. 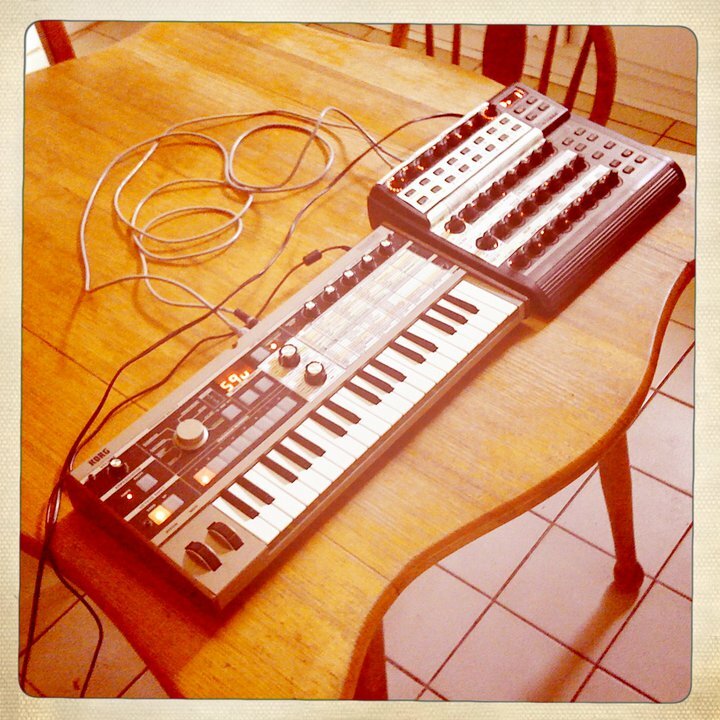 You should also be able to set up the MicroKorg to send a Data Dump over to the BCR2000. But I haven't been able to get either operation to work. Please help if you know how! I'd love to hear what people think of it! It's well worth doing, if you want to be able to really tweak the sounds live! Thanks Mike! That looks like a good lead! You Clearfield many things about this advance midi control box. I'm having a hard time setup it up with Logic Pro. Don't work. Any help would be appreciated. Thanks Anonymous, I'll try out that editor and add the BCR SYSX file to this blog post. Thanks! I just bought a BCR2000 myself and find your "programming lesson" very useful and inspiring! Thanks. (And I like your self-mockery!). Indeed sysex (and of course a computer) is the way to go to preserve your settings. Alternately, just edit the settings on the BCR2000 itself, directly. It's really not that hard, and you can test it as you go. Then you just save it on the BCR itself. I've finally updated my post, with the saved out SYSEX file that contains the preset, ready to transfer over to your BCR2000 via BCFREdit, without having to program it all in yourself manually. Find it in the main post above. Hey this is also cool. (Same anonymous as commented on your overlay sheet earlier today here). I have the Behringer BCN44 which is smaller than the BCR2000, but also very powerful, and I could imagine doing similar stuff with it. I'm getting pretty excited. It would be quite cool to just have those 4 knobs constantly assigned to the functions of the MicroKorg that you want to get too all of the time, such as Cutoff, Resonance, and maybe Filter EG Intensity, and something like Amp Level, or Noise, or something. That way, when you're editing sounds on the Microkorg's interface, you can still always grab the BCN44 and tweak the Cutoff and Resonance, for example. Hey ! Thanks for your help ! Have you resolved the problem to send all the values over to the BCR2000, each time you switch to a new "instrument" on the MicroKorg ? Cheers Romain, glad it was helpful! NO, I haven't yet found a solution for how to update the BCR with the new settings, when changing "instrument". I'm hoping someone will be able to tell me how to to do it, one day! It would make this system really cool, and complete! 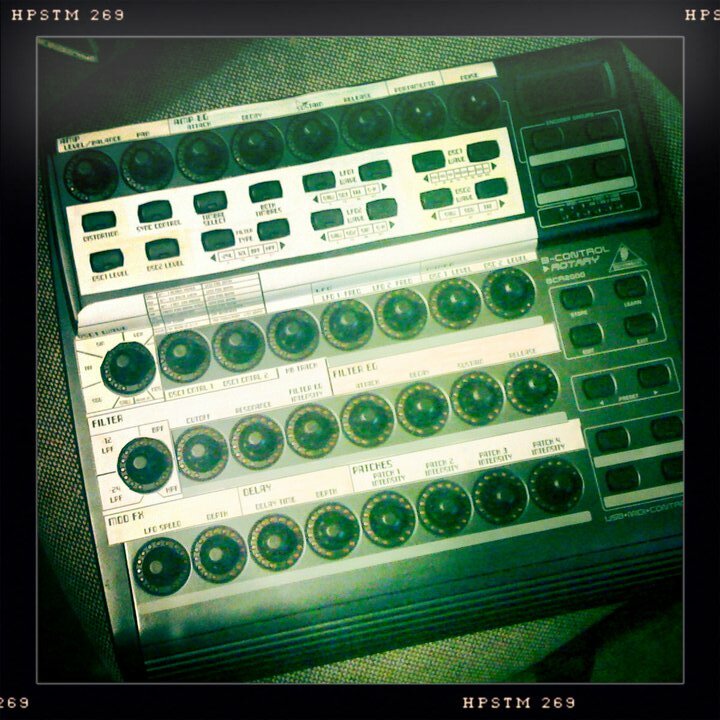 I just bought a Behringer BCR 2000 second hand, it is full of preset from the previous owner. How do i turn it to the original Factory Reset ? I can't find it anywhere ! Good point, you know I can't find out how to do that either, by looking through the manual! You could try using the software BCRFEdit, that I talk about in my post. It lets you edit settings quickly on the computer, and dump them over to your BCR2000. You could see if there's a FACTORY DEFAULT preset somewhere out there, in the format for BCRFEdit, and dump them onto your BCR2000, to effectively "reset" it. This guy mentions on his blog that he tested it out by "...uploading and saving the unit's default configuration..." using BCFREdit. You could ask him if he still has the file he could send you. Very helpful. Had my BCR for 2 months but haven't plugged it in yet. Baby. Anyway, will be using your preset and the video should help me set it up for some other synths I have- DX7, Alph Juno. Glad it was useful, @dkhbrit! The BCR is relatively easy to program, but you do need to read the manual to really kinda "get it". I think with software like Ableton, you can use the BCR without really thinking about it too much, because Ableton itself is smart! But if you're doing hardware-to-hardware stuff, it pats to just read the manual, and play around with the gear until it all makes sense. Makes things much easier, and therefore more powerful! This was incredibly helpful! Thank you so much! I took the remaining OCS2 controls and put them on the second bank of encoders--which works quite well because switching banks only changes the functions of the encoders, so everything else is operable when you switch. Of course, you can just control them with the microkorg, but I was having fun. I found this very helpful, so this is not a criticism of your work. Still, I noticed that you have a few duplicate functions mapped out on the BCR (you have an encoder and two buttons controlling OCS1 types, filter types, and LFO wave type), so I left them to the buttons and used the three left-over encoders to take on the last three functions that you left off--OSC: Mod, semitone, and tune. This is a better solution to the problem dealt with by the post above me. True true. I did duplicate some functions onto different controllers, for different ways to interact with the functions. I set it up with the tradeoffs I liked best for myself. But your way sounds like a nice alternative too, with those extra functions on there. :) Thanks for sharing your version! halo, i have a micrKorg xl+ would it working also with this? Halo there! I believe it works similarly, but the MIDI CC numbers are different on the new models of the MicroKorg, so you would be best to follow my instructions, but look up in your MicroKorg manual what each parameter needs to be mapped to, in terms of the MIDI CCs. Amazing! I'm looking for that for years,... Great job and so good tutorial. You have to launch a Synth school! Thankx. Bruno.